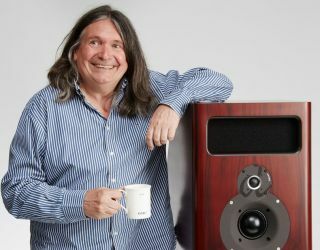 PMC's Peter Thomas: the missing link between the BBC and Prince | What Hi-Fi? From not-so-humble beginnings supplying the BBC with monitoring speakers, PMC has grown into one of the most successful specialist loudspeaker manufacturers on the planet. Pete Thomas: It started early on, when my grandfather gave me his wind-up gramophone. I was fascinated by how it worked and sounded – it seemed almost magical. Then I began collecting 78rpm records, which started my lifelong passion for sound and music. By the early 1970s I was an avid hi-fi enthusiast, constructing my own speakers and amplifiers before going on to study Electronics at Canterbury. I was introduced to IMF transmission lines by Tom Barron (now PMC’s UK sales manager) at the Audio Olympia show in London. “You’ve got to hear these, there’s something very special about their sound,” he said. That was another lightbulb moment. PT: Garrard SP25 MkIII, Shure M75EJ MM cartridge, Armstrong 625 Tuner/amp and Wharfedale Dovedale III (3-Way) sealed boxes, Sony TC377 reel-to-reel. My bank manager couldn’t understand why I needed to borrow such a lot of money, but I convinced him it was worth spending money on things you are passionate about. These were the days of Audio Supplies in Notting Hill, where you visited a grumpy warehouseman who gave you a big brown box in exchange for a roll of cash. That’s exactly what I did. PT: In 1977 I had an engineering position in BBC Radio, based in Broadcasting House, initially servicing both valve and semiconductor amplifiers, tape machines, turntables, mixing desks and monitor speakers. I moved into project work and designed a bespoke turntable to transfer 78rpm discs, and another to play a wide variety of cylinders from the BBC library. This led to contributing to BBC Radio series, such as Revolutions in Sound, which broadcast acetates from another of my interests – my collection of early Elton John recordings. I became manager of BBC Outside Studios, with responsibility for Maida Vale studios, and also looked after the technical facilities for Radio 1, 2, 3 for rock, big band and classical sessions. It gave me a huge insight into the world of music, across all genres, and fuelled my passion for great-sounding audio equipment. WHF: What was the BBC like back then? PT: When I joined it was very ‘public school’ and extremely formal. Many employees were former officers approaching retirement, having been recruited straight after the war. As TV accounted for most of the licence fees, radio had been set in aspic since the 1930s. A good example: when we had to change valves in a mixing console, its stamp was usually pre-war. With the colour licence, revenues grew throughout the 1970s. There was a larger budget for radio studios and recording facilities, so all the old valve kit was scrapped and replaced with solid state, using the latest integrated circuits. The BBC had over 200 studios, most of them ‘talk’ but many music and drama facilities. It was a huge network to upgrade and manage. WHF: How/why did PMC come about? PT: My work as the loudspeaker representative for BBC Radio involved working on the revision of the LS3/5a and focused my evaluation of speaker performance through controlled listening tests. Moving into the BBC’s music studios, this work soon centred on the need for cutting-edge monitoring speakers which could be used reliably at high volumes. I worked with many speaker companies in an attempt to achieve this. At the same time, a friend, ex-BBC engineer Adrian Loader, and I were looking to replace our hi-fi speakers. We auditioned all the top ‘reference’ models available, but none of them felt much better than designs of 20 years earlier, so we decided to design a speaker for our own use. Several years’ work in our own time resulted in a prototype loudspeaker design [the fifth, so dubbed BB5], which BBC Radio chose for their new music studio at Maida Vale. And after 27 years, they are still in daily use. The design was certainly not conventional. Whereas the majority of speaker designers used the relatively simple principles of ported or sealed cabinets, we looked for a far more sophisticated approach that would benefit both the studio and home user. After extensive tests, we found that the theory of a transmission line system for bass loading, if refined, gave a performance that significantly exceeded the conventional bass loading principles. This is the point when the Advanced Transmission Line was born. I resigned from BBC Radio in 1991 and formed the Professional Monitor Company (PMC) with Adrian Loader. We began production of the BB5 active speaker system, supplying professional studios around the world, including the BBC, Metropolis Studios, Sony mastering and Capitol Studios. Customers included Stevie Wonder, Prince and Robbie Williams, to name just a few. WHF: PMC is known for its transmission line designs. Why do you think this technique is better than other types of bass tuning? PT: We felt there were plenty of ways speaker design could be improved and better products aren't made by following the crowd. One way was to evolve transmission line design, which can give enormous benefits over conventional loudspeakers, but is notoriously difficult to get right. One advantage to this approach is that the bass driver is controlled over a wide frequency range, which in turn significantly reduces distortion. A spin-off from the lack of distortion is that the upper bass and midrange detail is not masked by harmonic distortion in the very low frequencies. The result is a transparent midrange and fast attacking bass, all with real clarity. Another advantage is a cabinet that produces a higher volume and greater bass extension than a ported or sealed design of a similar size, even if the same drivers are used. WHF: Why don’t more companies use transmission lines? PT: It is difficult to get it right and so takes a lot of time, effort and resources. For many companies, it isn’t financially viable to manufacture transmission line cabinets and bespoke drivers to match them. We take the approach that the result is far more important than making a product to a set price point. Original TLs weren’t ideal - it took a huge amount of work to reinvent them creating our own acoustic modelling techniques, damping materials and driver design to develop the original transmission line theory to ATL. WHF: What makes PMC different from its rivals? PT: We believe the music is what really matters - it’s what moves us and gives us the passion for what we do. We founded the company because we felt there were no loudspeakers transparent enough to convey music realistically – and Adrian and I knew we could remedy this using advanced engineering and a holistic design approach. This is, of course, much harder than it sounds. It is often easier to create loudspeakers that colour or flatter music, adding their own sound — but that is not our way. Sonic neutrality and transparency has always been our obsession, all in the interests of reproducing music as vividly and faithfully as possible, just as the artist wanted you to hear it. Putting it simply, it’s easy to produce a loudspeaker that is either neutral but boring or lively and extremely coloured - neither is good to reproduce all genres of music. The goal is to combine neutrality and dynamism. WHF: With your BBC background, were you tempted to follow the engineering principles – thin wall cabinets and so on – of its speaker designs? PT: We do follow the design procedure the BBC developed over 40 years by initially using speech to develop a speaker, as the human ear is most sensitive to that, then we move on to music later. The template we follow is to neither trust measurement or subjective listening exclusively… it takes a balanced view of both to create a world-class design. The BBC’s thin wall mass damping techniques was absolutely cutting edge for its time, but to reduce and eliminate all that is not music takes more inert materials and techniques. WHF: What’s your favourite out of the speakers you’ve worked on? Why? PT: It could be the BB5 – that was the first speaker we produced commercially, and it set us on the road of what was to become PMC. Without that, we wouldn’t be where we are today. On the other hand, we’ve spent the last 26 years perfecting our engineering art and have just released Fenestria, the pinnacle of what we can produce. I am particularly proud of the fact that my son, Oliver, was the head engineer on the project. WHF: Measurement or listening - which takes priority? PT: We take measurement as seriously as listening. We use a huge amount of cutting-edge measurement when designing our speakers, including our partnership with the National Physical Laboratory. Here, we use the most sophisticated laser measurement techniques to ‘see’ the sound emanating from the speakers. This enables us to design all the elements of the speaker to work together and create the best speaker we can design. Every speaker we build is subject to a critical listening test, which is the ultimate determiner before it is packaged and sold. The music it reproduces is, after all, the most important thing. However, we can’t create such good speakers without the measurement, so both have an equally valid place. PT: That is a very close-run thing! Either the Gale 401 or Quad ESL57. PT: Anything and everything! I have over 10,000 vinyl records, 5000 78s and I don’t know how many CDs and reel-to-reel tapes of every genre. But I must admit to being the one of the largest collectors of Elton John’s work, from his original demos to unreleased material. PT: Twist and Shout EP. It cost 10 shillings and sixpence from a Canterbury record store. WHF: Your three favourite classic hi-fi products and why? PT: The ultra-rare Gale record player, Lecson AP1 & AC3 Pre Power and the chrome capped Gale 401s. I’m lucky to have them all. They are part of our historic archive of all the significant audio designs over the years. WHF: What’s your system at home? PT: Roksan TMS, Artemis Arm, Koetsu Black, Garrard 401 with SME3009 series II improved for the 78s, PMC Cor integrated amplifier, Studer B67 reel-to-reel and PMC Fact.12s. PT: I’d prefer the product to not have any sonic qualities. I’d rather hear music! WHF: What do you think speakers will be like in 20 years? PT: Active, wireless, voice operated, smaller with greater performance. Hopefully.